Susan Murphy, RN, BSN, MS, Chief Experience Officer, University of Chicago Medicine, is the recipient of the Kate Granger Compassionate Care Award that will be presented at the HIMSS18 Nursing Symposium in Las Vegas. She and her team recently shared how their iPad rounding process helps enable a better patient experience and stronger employee engagement in this video. As a nurse myself, I knew we couldn’t just tell our nurse leaders, “Here are some iPads, here’s what we need you to do, go out and get some patient comments.” Nurse leaders have a lot of responsibilities, and they have to deal with a lot of competing priorities. We went out and spent time with them to understand their work, to help them understand the value of iPad-based rounding for them and their teams, and to find ways we could work with them to make this approach as valuable as possible. We had to understand the context of a nursing leader’s life in order to support them, and we had to do it in a way that respected their professionalism and workflow. Our approach was much more along the line of, “Here’s how valuable it will be to get and share patient comments and patient needs in real time, so here’s an iPad.” We started with the “why” in the middle and worked our way out instead of starting with the iPad and working our way in. We know that the quality of how nurse leaders round on patients is critical. We don’t want people to focus on the screen or the questions and forget to focus on the person. We rounded with the nurse leaders in many different clinical areas to guide and acknowledge their conversations with patients, and to help them become comfortable using an iPad in a room for rounding. We use the data we collect about patients’ perceptions of rounding and their care experience to understand how to support nurse leaders. Some might need help adjusting their workflow to make room for rounding. Others might need coaching to connect more genuinely with the patients they round on. Rounding brings value to patients when they feel a human connection with their care teams. We use the data from rounding to drive value for both patients and nurse leaders. One of the best examples of that happened early in our iPad rounding efforts. We had a situation where all the nurse managers knew that our food services were not as good as they needed to be for patients. When they started rounding with the iPad, they were able to capture each patient complaint – and there were many. Our patient engagement and experience team looked at the data and said, “Wow, we have a lot of problems with the food service.” We explored the problem in depth and raised it to the COO. Ultimately, we changed vendors. This experience made the nurse leaders see that iPad based rounding was a platform for having their collective voices heard. They all individually knew about issues with our food services. The tool aggregated their voices together to initiate positive change. 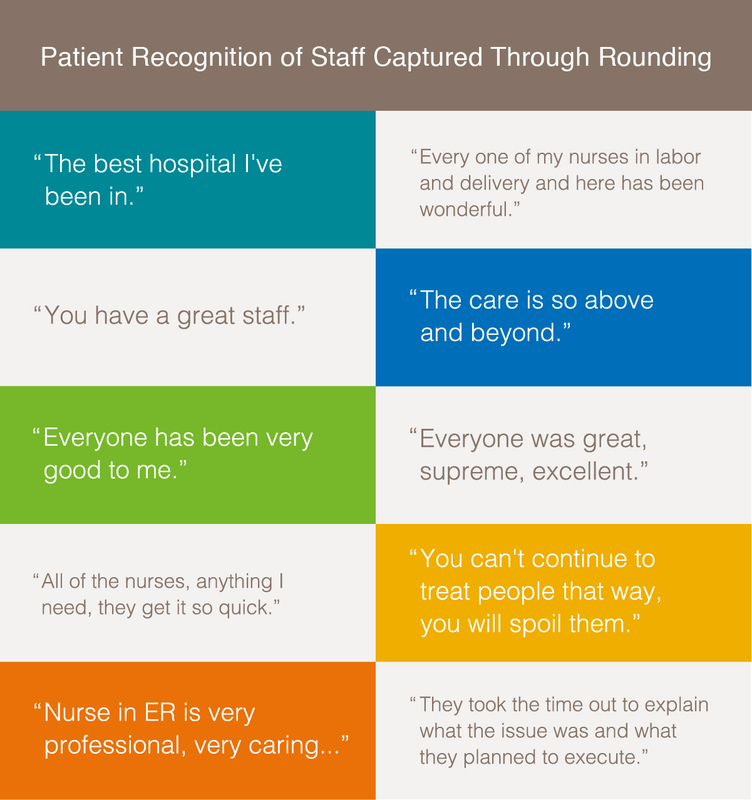 One of the best things about our iPad-based rounding is that it gives our nurse leaders a means to recognize, reward, and acknowledge the people who care for the patients. Our patients share so many comments about the people who care for them – not only nursing, but food service, environmental services, transportation, and others. Team leaders get these comments each day and can recognize team members and say thank you, which team members really appreciate because caring for patients is why they went into healthcare in the first place. Our approach to rounding lets team leaders reinforce positive behavior. In many ways, rounding is a type of clinical assessment. When we undertake other types of clinical assessments, our goal is to go in and fix what’s wrong. With our approach to rounding, we do see if something is wrong, but we are actively looking for what’s right, and it’s a whole different way of being. We started iPad rounding in our inpatient units, but we’ve expanded far beyond that. In addition to rounding in our in-patient units, we round in both our children’s and our adult emergency departments. We round on patients coming in for ambulatory surgery. We round on patients coming to their medical practice offices, and to their doctors’ offices in certain areas. We round for the whole continuum of care. We keep focusing on refining the rounding questions to make sure we’re capturing the most important information. We ask patients about their comfort, whether we’re communicating clearly, and whether they have what they need. When we started, we had a lot more questions, but we are very disciplined to make sure all the data we collect helps us care for our patients while they’re with us and improve our service overall. That’s the real value. With iPad-based rounding we can capture the voice of the patient and get a pulse on how they perceive the quality of care while they’re still here. We can uncover issues right away and correct them. We can also trend and track opportunities for recognition. We measure the impact of iPad-based rounding so we can justify the investment and continue to refine the process. In our patient satisfaction surveys, we look at our overall rating of care scores to see improvement in care. One of the quantitative questions we ask in-patients is if they were rounded on every day when they were here. For those who answer yes, we see a 74% increase in their satisfaction score for their overall rating of care. This is more than just rounding. We’re fostering a culture of engagement for both the patient and the healthcare providers. We reinforce it using a tactic – rounding – that we all know works. We use technology to enhance what we’re doing. But it’s not about the technology, it’s about how you bring the practice of rounding to life and sustain it so people understand why we’re doing it and what a difference it makes to them as a caregiver and to the patients we care for. Our rounding practice is about making sure patients feel the caring; that’s the environment we’re trying to create. Watch the video to learn more about how our iPad rounding practice helps enable a better patient experience and stronger employee engagement. Learn more about Vocera Care Experience, which University of Chicago Medicine uses for its Care Rounds and follow-up Care Calls.